In a growing economy, Real Estate sector invites a lot of attention from all quarters including foreigners. India has a policy for non-residents which invites them to invest in the Construction and Development sector. For investment in independent premises, the policy is open only for NRIs. In this article, the FEMA provisions have been discussed under 2 parts – one relating to Real Estate business, and the other relating to Investment in independent premises. An important difference between Income-tax Act and FEMA may ne noted. Income-tax Act is a revenue law with a fully developed appellate process. One may interpret the law literally, and may do tax planning. FEMA is a policy law. Appellate process is practically absent. Courts are known to take usually a pro-RBI view. Hence it is better to comply with the law in letter and spirit. Real Estate business can be broadly of three kinds. One is “Development” where the developer builds new property and sells the same. The second is developing or buying real estate and “leasing” the same. The third is “trading” in property. Briefly, “Development” is permitted. Investment for “Leasing” and “trading” is not permitted. For leasing of property, see paragraph 10 below. Development and leasing is slightly controversial. See paragraph 10. Related activities like building material, maintenance, real estate agency are not a part of “Real Estate” policy. These are covered in the general FDI policy. Most of the activities are permitted on automatic basis. Key to understanding the difference between “Real estate development business” and “related activities” is : “Whether the non-resident investor (through the Indian company) will acquire ownership rights over the immovable property or not.” If he acquires ownership rights, it is real estate development business. The Foreign Direct Investment (FDI) Policy is laid down in the Consolidated Policy of 1st October 2010. (The policy has been there for the past few years. It is just that every 6 months, the Government comes out with a Consolidated FDI Policy which replaces the earlier Consolidated FDI Policy.) The FDI Policy has to be read with FEMA Regulations. The original policy was laid down vide Press Note 2 dated 3rd March 2005. In this policy, reference has been given to the Consolidated FDI policy or the original press note or FEMA regulation as relevant. Non-residents are permitted to invest in Real Estate Development activity through Indian companies. Investment through LLPs, partnership firms, branch, or any in any other manner is not permitted. Direct business by non-residents is not permitted. The investment is subject to a few conditions discussed in subsequent paragraphs. Non-residents can invest upto 100% of the equity capital of the Indian company. Investment is permitted on automatic basis. Investment can be in equity shares, or Fully and Compulsorily Convertible instruments (preference shares or debentures). For NRIs, there is a separate policy. This is discussed in paragraph 5.2 below. Theme of the policy is that non-residents are not allowed to hoard or speculate immovable property. They cannot create “Land Banks” and hold them. At the same time, they are welcome to develop real estate. Each project of Real Estate development should comply with the specified conditions. Conditions relating to area are discussed in paragraph 3 and conditions relating to investment are discussed in paragraph 4 below. i. In case of development of serviced housing plots, minimum land area should be 10 hectares. ii. In case of construction-development projects, minimum built-up area should be 50,000 sq.mts. iii. In case of a combination project, any one of the above two conditions should be satisfied. 3.2 The meaning of serviced plots has been explained in the Press note. It means where roads, water supply, street lighting, drainage, sewerage, and other conveniences, as applicable under prescribed regulations, have been made available. This infrastructure should be provided and a completion certificate from the concerned local body/service agency should be obtained before selling the serviced housing plots. Unserviced plots cannot be sold. 3.3 At least 50% of the project must be developed within a period of five years from the date of obtaining all statutory clearances. 3.4.1 The project should conform to the norms and standards as laid down in the applicable building control regulations, and all rules regulations of the State Government/Municipal/Local Body concerned. 3.4.2 The investor/investee company will be responsible for obtaining all necessary approvals under applicable rules of the State Government/ Municipal/Local Body concerned. 3.4.3 The State Government/ Municipal/ Local Body concerned, which approves the building / development plans, would be required to monitor compliance of the above conditions by the developer. The built up area should be 50,000 square meters. How does one calculate the area? There are different areas mentioned by the builders. It is clear that saleable area is not to be considered. Will the area be calculated as? - the plinth area – length x breadth x floors. - built-up area which includes the inner walls of the premises & upto outer wall of the premises. Will it include the following? I understand that when the local authorities approve the plans, some areas are not considered as a part of built up area – like balconies and parking lots. If the areas for balconies and car park are considered, it will be easier to satisfy the minimum area required to be built-up. The guidelines state that bye laws and rules of the local authorities should be complied with. Hence whatever area is permitted by them as permissible built-up area can be considered as built-up. This would mean that balconies and car park area cannot be considered as constructed area for these guidelines. DIPP takes a view that area considered as built-up by the local authority will be considered. The non-resident investor should invest a minimum of US$10 million in wholly owned subsidiaries, and US$ 5 million for joint ventures with Indian partners. The funds have to be brought in within six months of commencement of business of the Company. If joint venture partners are all non-residents, the minimum investment to be brought in US$ 10 mn. If there are Indian partners, then the minimum capitalisation is US$ 5 mn. The condition for capitalisation is only at the initial stage. For example, one project is completed and the company has recovered its investment. It wants to commence another project. In this situation, the investor does not have to bring the funds again. Sale proceeds of the earlier project can be utilised for the new project. However the new project should have the minimum area as prescribed. i) What is “joint venture” has not been explained. One has to give a normal commercial meaning. If the Indian partner is investing say only 1%, will it be sufficient to say that he is a joint venture partner? It certainly cannot be said that he is a joint venture partner. One has to look at the whole joint venture – how much is the Indian partner investing, how much is his contribution, what are his responsibilities as a partner. Then one can take a decision whether the Indian partner is a bonafide partner or not. ii) Should the minimum investment comprise of face value of shares, or can the investment include premium? The investment can include premium. Here the minimum investment is the amount of funds which should be invested in the Indian company. 4.2.1 Original investment cannot be repatriated before a period of three years from completion of minimum capitalisation. Say the first installment of investment of US$ 2 mn. is brought in on 30th September, and the balance investment of US$ 3 mn. is brought in on 1st January. Assume that the investment is in a joint venture with an Indian partner. The lock in will apply for 3 years from 1st January. Beyond the minimum investment, the lock-in period of three years applies from the date of receipt of each installment of FDI. Thus later of the two applies – date of achieving minimum capitalisation or the date of investment of installment. It also means that the lock-in applies to the entire investment, and not just the minimum amount required to be brought in. The policy clearly provides that the lock-in period applies to the “Original investment”. Original investment means the entire amount brought in as FDI. 4.2.2 The lock-in applies even if the non-resident investor wants to transfer shares to another non-resident. In one such application, FIPB rejected the proposal for transfer of shares from one non-resident to another, although the DIPP was in favour of the transfer. 4.2.3 For some reasons if the investor wants to exit earlier, a prior approval from FIPB is required. Generally the FIPB is not in favour of an approval unless there are compelling reasons like cancellation of a project. In one such case, FIPB had approved the sale before the lock-in period as the project was being abandoned. It was subject to compounding process. 4.2.4 After the lock-in period for the investment is over, the investor can sell the investment to another non-resident. Is the lock-in period applicable to the non-resident who purchases the shares? The guidelines are silent on this. Prima facie, the lock-in applies to all non-resident investors whether they are the first investors or subsequent investors. Further, investment is permitted for development projects. Hence if the Investee company is planning to commence a new project, the purchaser non-resident can acquire the shares. However if the investee company does not any project, or has semi-finished projects, the purchaser non-resident cannot acquire the property. See paragraphs 5 and 6 also. Thus in essence, if the conditions or press note 2 of 2005 are satisfied, then the non-resident can acquire the shares. Do the guidelines apply to hotels? The guidelines apply only if the project involves construction of real estate, and selling the premises. Hotel project does not involve selling the developed units. Hotel industry is a service industry. These norms do not apply to a hotel. Thus the hotel can be of an area less than 50,000 square meters. The policy clearly specifies that the conditions for real estate development do not apply to Hotels & Tourism & Hospitals. The guidelines do not apply to infrastructure like roads, ports, bridges, etc. These are not real estate projects as such. The guidelines also do not apply to development of SEZs. Provisions of the SEZ Policy will apply. However, other conditions stated in paragraph 3.4 above do apply to all projects. The guidelines do not apply to investment by NRIs individually. If however NRIs wish to invest through their foreign companies (or any non-individual entity), then the FDI guidelines will apply. NRIs are also permitted to invest on non-repatriable basis. Investment can be made in a company (schedule 4 of FEMA notification 20), or a firm or a proprietory concern (FEMA notification 24). Investment in an LLP, AOP, or any other entity is not permitted. Real estate business means only construction and development activity. Thus leasing or trading is not permitted. Investment in agricultural property, plantation, and farm houses is not permitted. The company could have projects of different sizes. Some projects could be FDI compliant (minimum 50,000 sq. meters), and some may not be FDI compliant. Can the non-resident invest in such a company? Can he invest with a condition that his investment should be utilised only for FDI compliant project? Such an investment would not be permitted. All projects should be FDI compliant. This is because while the investment can be directed in the FDI compliant project, it cannot be ensured that the profits and returns of only FDI compliant projects go to the non-resident. Therefore wherever there is a Foreign investment (other than NRI individual), only FDI compliant projects should be undertaken. A company may have real estate and non-real estate business. Can a non-resident investor invest in such a company? The non-resident investor can certainly invest in such a company. However it is necessary that each project of the company is FDI compliant. If any project is not FDI compliant, the investment cannot be made. There may be some practical difficulties. For example, the non-resident will not be able to sell the shares before the lock-in period (even though for non-real estate business there is no lock-in). To take another example, the lock-in period may be over, but conditions of the real estate project-are not fulfilled. Then also, the non-resident will not be able to sell the shares. For practical purposes, it is advisable to keep FDI compliant projects in one company, and the remaining business in another company. (i) FDI is prima facie permitted in a new project. i.e. The Indian company should construct the premises. If the project is semi finished, then in my view the non-resident cannot invest in the company. The guideline suggests that investment should be brought in within 6 months of commencement of business of the company. It suggests that investment is welcome in new business. (ii) If one takes a view that investment in semi-finished project is allowed, then it leads to the next question as to how much of the project may be unfinished. For example, can the project be 99% finished, and then the non-resident invests? This will almost amount to trading in Real estate. (iii) There could be a contrary view. If one takes a view that no investment can come in semi finished project, then a large company will always have a number of running projects. There will always be in some stages of development. Non-residents will never be able to invest in such a company. (iv) A balanced view may be as under: The Indian company may have a project under construction. Some work is already finished. However, the pending work is so large that the whole of non-resident investment will be utilised in construction costs. In such a case the conditions would be satisfied in spirit. (v) In case of serious doubt, it may be better to take a approval from FIPB before investing in semi-finished projects. The non-resident investor can purchase shares from Indian resident investors. It is clear that if the company has FDI compliant projects, shares can be purchased. The funds will go to the Indian shareholders and not the company. In this situation, will minimum capitalisation norms apply? The guidelines are silent. As per the policy, that non-resident investors should bring the minimum funds as required as per capitalisation norms. In case of doubts, it will be better to apply to FIPB. It is safer to take a view that the entire guideline for Real Estate development, lock-in, etc. will apply. The joint venture has to be at the company level and not the project level. Consider an example. A non-resident invests in an Indian developer company. The Indian developer company enters into a contract with a land owner to develop the property. On completion of the property, the land owner will be entitled to a certain percentage of flats. The Indian developer company will be entitled to the remaining flats which it will sell. The above structure is resorted to as the non-resident and the Indian partner may be interested in the partnership only for one project. This kind of proposal is permitted provided that the Indian developer company obtains approvals for development, markets the flats and other aspects of FDI policy are complied with. However should the non-resident investor invest US$ 5 mn. in the Indian company or US$ 10 mn.? If the investment in the Indian developer company is owned to the extent of 100% by the non-resident, investment of US$ 10 mn. is required. If the land owner had invested in the Indian developer company, the minimum investment required would have been US$ 5 mn. The non-resident and Indian resident investors may want to have partnership for specific projects and not all the projects. What are the different options available? 8.1 A simplest option is to have one company for each project. The non-resident and the resident investors can invest in the company, specific for that project. This will of course mean that in every company, the minimum amount of capitalisation will apply. Lock-in period will apply. Alternatively, there can be two companies - (i) FDI compliant projects where the non-resident wants to invest, and (ii) Other projects. 8.2 It is however possible that the non-resident may want to form a holding company. Under the holding company, there can be different subsidiaries for different projects. In different subsidiaries, different Indian partners can invest. To invest in the Indian holding company, an FIPB approval is required. If however the non-resident holds shares in an operating company (with active business), then investing in the subsidiaries can be done on automatic basis. In this situation, the real estate guidelines apply to the subsidiaries. Can the Indian company acquire agricultural land with a view to convert into non-agricultural land for real estate development? Under FEMA, non-residents are not permitted to invest in agricultural land. However for the purpose of real estate development, if agricultural land has to be acquired, an application should be made to FIPB and a prior clearance should be obtained. Foreign investor cannot acquire property for the purpose of leasing. It is not a permitted activity. However if the property is constructed and then leased, it is permitted. The policy does not make this explicitly clear. However this is the view of the Central Government. It appears that RBI has not agreed with this view. Hence the investor can write to FIPB and obtain a specific confirmation in this regard. - the lock-in period of 3 years should be completed from the date of investment or minimum capitalization norms, whichever is later. - at least 50% of the project should have been developed within a period of 5 years from obtaining statutory clearances. 11.1 Assume that the project is of 100 residential units. The building is complete and more than 95 units are sold. Can the non-resident sell his shares? The clear answer is that the non-resident can sell the shares if the 3 year lock-in period is over. Thus if three years of lock-in period are completed; more than 50% of the project is completed – the non-resident can sell the shares. 11.2 However if the 5 year time for development is not complete, development is complete to the extent of less than 50%, but the 3 year lock-in period is complete, can the non-resident sell the shares? In this situation, the non-resident cannot sell the shares. Even if the Indian investee company / non-resident investor is confident of completing 50% development within 5 years, the non-resident cannot sell the shares. The development has to be actually completed. In case the non-resident wants to sell the shares, one may take an approval from FIPB. Assume that the project is 95% complete. However no unit is fully ready to be handed over to the buyers. Can the non-resident sell the shares in the company? Take another example. The project comprises of five buildings of 500 flats. Three buildings are ready. For two buildings, construction has yet to commence. Out of the 300 flats in the three completed buildings, only 100 flats have been sold. Can the non-resident sell the shares? There could be several permutations. The condition is that development should have been completed to the extent of 50%. The meaning of development has not been explained. One may take guidance from para 1c) of the press note 2 of 2005. In case of serviced plots, it is necessary that all infrastructure like roads, electricity, etc. should be completed before selling. Thus development cannot be considered in terms of the extent of the completion of the project, or the value. In my personal view, “developed” means ready for sale. The premises should be livable and completion certificate should be obtained. Thus in the above examples, if 95% of the project is complete but no unit is livable, it will not be considered as developed. In the second example, where 300 flats are ready for sale, the project will be considered as developed to the extent of more than 50%. The guidelines state that 50% of the project should be “developed”. There is no condition of sale / lease. Hence if at least 50% of the project is fully complete, the non-resident can sell the shares. The objective is that new property should have come into existence. If that is so, the non-resident can sell the shares, although independent premises may not have been sold. 11.4 If the project cannot be completed within a period of 5 years to the extent of 50%, what can be the consequences? In my personal view, it will be considered that the conditions have not been fulfilled. One should approach FIPB and take approval for an extension. If an approval is not taken, it will be a violation of FEMA. Typically a non-resident requires minimum returns from the project. The non-resident proposes that he is willing to invest a certain amount with the builder. He expects a minimum return. The minimum return can be by way of interest; or buy-back of shares gives the minimum return. Is this possible? Under FEMA, an Indian resident cannot give any guarantee to a non-resident. Hence to offer any minimum return is not possible. Under the FDI policy, the non-resident invests in equity shares. As equity shareholder, he is the owner. The owner cannot get any minimum guarantee. Loan cannot be taken from a non-resident. Till 31st Dec. 2010, ECB was possible for large projects exceeding 100 acres. That facility has been discontinued. Hence to offer any interest on loan to the non-resident investor is also not possible. There can be however a cap on the return which the non-resident can be given. The FDI policy provides that the non-resident can sell the shares to an Indian resident at a price which does not exceed the fair value of the shares. Thus for example, there can be an agreement between the non-resident investor and the builder that in case of a buy-back, the price will be lower of – i) price as per FEMA rules, or ii) Rs. ______ (based on agreed formula). The buy back can be at a price less than the fair value of the shares. Normally the real estate projects in India will have expenses to be incurred in India. However there could be some services procured from abroad for which remittances may have to be made. Normally, expenses are in the nature of current account. These can be incurred without any approval from RBI. There are however a few expenses where there are restrictions. Real estate agents can be appointed abroad for selling the flats to NRIs. Commission can be paid to them within the specified limits. Commission can be paid upto US$ 25,000 or 5% of inward remittance, whichever is more. The limit is per transaction. The commission can be paid to the agent, or the agent can deduct the same from the sale proceeds of the flats. Consider a situation – The foreign agent sets up an Indian company for conducting real estate brokerage. This company is an Indian company. Real estate brokerage is under automatic route. Hence no approval is required for investing in the company. The Indian company acts as a broker for NRIs. It charges brokerage exceeding 5% of the inward remittance. After payment of income-tax, the profits can be repatriated out of India. Is this workable? In my view, legally there is no restriction on such a arrangement. It would not amount to circumventing the rules. In this situation, the non-resident sets up an Indian company, invests capital in India, will pay taxes in India. Thus one cannot consider this to circumvent the rules. The Indian company may procure consultancy services from foreign consultants. Under current account rules, upto US$ 1,000,000 (one million) can be paid per project. The provision does not elaborate the meaning of “consultancy service”. There could be several services which the Indian company may incur for services of – architect, landscaping consultant, lawyers, etc. In a large project, there could be several consultants for various purposes. In my personal view, consultancy services should be confined to the overall consultancy for the project. If there is any specific service like payment to structural engineers, that will not “consultancy”. However this area is not free from doubt. It will be advisable to obtain approval from RBI before making any payment exceeding US$ 1 mn. Press Notes 2, 3 & 4 of 2009 lay down the policy for direct & indirect investment. “Direct” investment refers to non-resident investment directly into the Indian company. 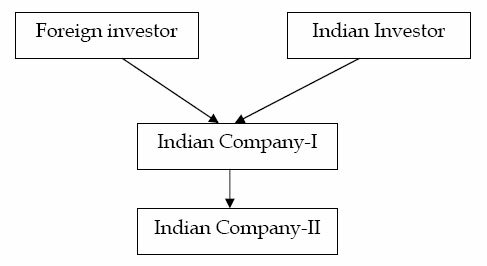 “Indirect” foreign investment refers to investment by the non-resident through an intermediate Indian company. As per the criteria discussed above, the Indian Company-I will be considered as “Indian investor” or “non-resident investor” depending upon facts. Assume that 51% of the shares of Indian Company-I are held by Indian citizens & residents. The company is also controlled by Indian citizens & residents. This company can invest in Indian Company-II without any restrictions of FDI policy. Thus the non-resident investor can participate in the Real Estate Sector upto 49% without the need of minimum capitalization, lock-in, etc. In fact, Indian Company-II can undertake real estate trading also. Is that the intention? The plain reading of the press notes permit such an investment. RBI has still not amended FEMA notification No. 20. The Consolidated FDI policy states that wherever there is an issue of interpretation, FEMA will prevail. Therefore, in my view, investing as stated above amounts to violating the spirit of the FDI policy. The Press Notes of the year 2009 are badly drafted. RBI has not amended FEMA notification No. 20 giving effect to these Press Notes. A conservative investor may avoid such schemes. Hence it may be advisable to get a clearance from FIPB before entering into such a structure. In sensitive sectors, it is better to be safe than regret later. Foreign Venture Capital funds are permitted to invest in India. Under SEBI rules, FVCI is permitted in Real Estate sector also. However, RBI has taken a view that if FVCIs are allowed to invest in Real Estate sector, then they may be able to by-pass the FDI guideline for Real Estate. Hence RBI does not permit investment through FVCI route, unless there is an undertaking given that investment will not to be done in real estate sector. India does not permit non-residents to acquire any premises in India. However NRIs have been permitted to invest in premises (houses and commercial establishments) for now almost 15 years. FEMA notification 21 regulates investment in immovable property. If however a property has to be acquired on lease for a period of less than 5 years, then the same can be acquired without any approval. This is typically required by foreign companies opening liaison offices in India. - His either of the parents or grandparents was an Indian citizen by virtue of the Indian constitution or the Citizenship Act 1955. However citizens of Pakistan, Bangladesh, Sri Lanka, Afghanistan, China, Iran, Nepal, and Bhutan are excluded from the definition of NRI. Citizens of these countries are not permitted to acquire immovable property in India. - Gift from another non-resident or an Indian resident. The NRI can even construct the property. There is no need of any approval from RBI. No declaration has to be filed with any one. It is however advisable to keep proper evidence of acquisition and source of funds (whether NRO, NRE or remittance from abroad). This can be useful at the time of sale and remittance of funds. Normally an Indian resident can give a gift to a non-resident under Liberalised remittance scheme upto US$ 2,00,000 per year. However in case of property, the gift can be without any limit. For purchase, the funds have to be paid from FCNR, NRE or NRO account, or remitted from abroad. Payment cannot be made by travellers’ cheques, or currency notes or any other mode. Thus in case one NRI purchases property from another NRI, the payment cannot be made outside India. It has to be made in India. The property can be residential or commercial property. Thus an NRI can acquire a flat, bungalow, office, shop or even a warehouse. Land can also be acquired. The property can be acquired jointly with any other NRI or with an Indian resident. While commercial premises can be acquired, no business can be done in the premises by the NRI. Thus an NRI may buy a warehouse. However he cannot undertake warehousing business. If he undertakes any business, it will become a place of business (like a branch). A non-resident cannot set up a branch without a prior approval from RBI. The conditions for a branch are strict. An individual NRI is not given an approval for a branch. The NRI can however invest in his proprietory concern on non-repatriable basis (Schedule 4 of FEMA notification 20). Legally, the proprietory concern being an Indian resident, can acquire property. However practically there may be difficulties as a proprietory concern is not an entity under general law. A better way may be that the NRI purchases the property in his own name, invests in his proprietory concern in India, and permits the proprietory concern to us the property for business. There is no limit to the number of properties he can purchase. However it should not amount to doing business. See paragraph 4 for more details. Agricultural land, plantations, farm houses (agricultural property) cannot be acquired by the NRI (whether by purchase of gift). If of course the NRI inherits an agricultural property, he can hold the same. However he cannot undertake any commercial agricultural activities. The NRI can lease the property and earn lease rent. The income can be repatriated abroad after payment of taxes without any limit. While an NRI can acquire immovable property and also sell the same, he cannot do business in the properties. For example, if the NRI acquires 10 shops in a row and leases them out, this can be considered as doing business. Similarly if the NRI purchases and sells property 2-3 times, it will amount to trading. What exactly amounts to business has not been explained. One has to consider the facts and determine the issue. - Sale to an Indian resident, or to another NRI. - Gift to an Indian resident or another NRI. However if he owns an agricultural property, it can be sold or gifted only to a person who is an Indian resident and Indian citizen. The NRI can also bequeath the property to any one including a non-NRI. Bequeathing the property (of any kind) to any one is permitted. 5.2 On sale, the funds can be remitted abroad to the extent the same have been remitted from abroad or paid from NRE / FCNR account. In other words, profits cannot be repatriated. The cost in foreign currency can be repatriated. The remittance is restricted to 2 residential properties. There is no restriction in case of commercial properties. There is no clarity as to how this limit of 2 properties should apply? Is it a lifetime limit? Under US$ 1 mn. scheme, funds can repatriated upto US$ 1 mn. per person per annum. Hence profits on sale of property can be repatriated under this scheme. 6.1 Non-NRIs cannot acquire any property in India. There is however a major change between FERA and FEMA. Under FERA, “citizenship” was the criteria for acquiring the property. If a person was an Indian citizen, he could acquire a property in India. If a person was a foreign citizen, he could not acquire any property in India (except as permitted to NRIs). Under FEMA, “residence” is the criteria. A non-resident cannot acquire any property. An Indian resident can acquire property. 6.2 Say for example, a foreign citizen of non-Indian origin is employed in India for 2 years. On coming to India for employment, he becomes an Indian resident. As an Indian resident, such a person can acquire property in India. FEMA actually does not apply to such a person as far as acquisition of property in Indian is concerned. Master circular (para 8(ii)) states that his type of visa should clearly indicate that his stay in India is “uncertain”. The language of the master circular can be misleading. - he stays in India on taking up employment in India. - he stays in India for carrying on a business in India. - any purpose which indicates his intention to stay in India for an uncertain period. Normally a foreigner is never given a visa for an uncertain period. It is always a fixed period visa. It will usually be “certain” that the person will “go back” after the visa expires. Typically the visa types would be employment visas, dependent visas, etc. The criteria given in master circular is only a guideline. What it means is that the visa will indicate the purpose of coming to India and that the non-resident will stay for sufficiently long period to make him an Indian resident. Thus a foreigner who comes on a tourist visa or short trip visa will not able to buy property in India. However if he comes for an employment of say 3 years, he will be considered as an Indian resident. Such a person who comes for employment, can purchase a property in India. 6.3 For sale of property, resident foreigners do not need any approval if they are Indian residents. However if they propose to sell the property after becoming non-residents, they will require approval from RBI. 6.4 There are several foreign citizens who have acquired property in Goa. They have come on tourist visa and have acquired the property. The Central Government has advised the State Governments to be careful at the time of registration of the property in case of foreign nationals. There are some citizens of Pakistan, Nepal, etc. who are staying in India. Can such people acquire immovable property in India? As explained, FEMA applies to property in India based on residential status. If Pakistani citizens staying in India have become Indian residents, they can acquire property in India. The regulations and master circular state that Pakistani citizens cannot acquire property in India (even if they are Indian residents). This in in my view goes beyond FEMA. It is an established principle that the sub-ordinate regulations cannot go beyond the principal act. To that extent the regulation prohibiting Indian residents who are citizens of Pakistan, etc. to acquire immovable property, are ultra vires. This issue is applicable to citizens of eight countries – Pakistan, Bangladesh, Sri Lanka, Afghanistan, China, Iran, Nepal or Bhutan. Foreign citizens who are non-residents can acquire property by way of inheritance. They can also continue to hold the same. However if they wish to sell property, they require approval from RBI. Foreign companies are not permitted to acquire properties in India. However if the foreign company opens a branch office or a project office, then it can acquire the property for its own activity. A liaison office cannot acquire any property except by way of lease for a period of upto 5 years. For sale, an approval of RBI is required. For acquisition or disposal of properties foreign embassy, diplomat and consul generals, am approval is required from the Ministry of External Affairs. Foreign investment is welcome in India but only within the specified conditions. FEMA law is a policy law. Hence the language creates controversies. For NRIs, the regime has worked well for the past several years. By and large, they have not faced any difficulties.